Jack came to work late all of the time, missed deadlines, and sometimes did an embarrassingly shabby job. He had potential, even moments of brilliance, and was a nice guy. But Ben couldn’t depend on him and found himself constantly explaining and making excuses to clients and team members on Jack’s behalf. Ben felt he had tried everything. He has had many straight up conversations about the issues. These always went well because Jack was always sorry and promised to do better. And he did. For a while. Long enough for Ben to grow new hope. And long enough to make the pain of disappointment fresh again. Ben knew it was time to fire Jack, but it was hard. Jack always had some story about being broke or sick or something happening that just kept the cloud over his head. The excuses were to the point that Ben didn’t know if it was all true or a way to manipulate his way out of getting fired. Firing Jack would be holding him accountable. Firing Jack would send him a message that he had to get his act together. Firing Jack would show his team that he didn’t expect them to carry someone else forever. Ben knew it was the right thing, but it was hard. Sally owned her own business and hired an accountant that supposedly had 10 years of experience. She said she was a whiz at Quickbooks and could set up all of the processes Sally’s new business needed. Three months later and not only was nothing set up or fixed, Sally had spent a bunch of time showing the new accountant her inadequate bookkeeping. The accountant was nice and all, but she really couldn’t do the job. Sally hired her so she wouldn’t have to train someone. Is it wrong to fire her if she is trying? Jason has worked for the firm for 5 years now. More than enough to study for and pass the architectural licensing test. He tried a few times but hasn’t passed. In the last couple of years, it seems that Jason has given up. The policy of the firm is that when you pass the exam and become licensed you get a significant bump in pay. Jason recently told the owner of the firm that his wife is pregnant and he will have a baby soon. He needs to make more money. He isn’t licensed, but he can do the work. He asks his boss for the pay level of a licensed architect. The owner knows he cannot bill the same rates for a non-licensed architect. He has given Jason every opportunity including paying for a study course. Is he supposed to give the guy a raise just because he needs it? These are all stories that happen regularly to small business owners. As a Christian small business owner, it becomes even more difficult for the owner because they want to follow Christ and love others well. But is it loving them to enable them to continue to not perform, to exaggerate their experience and skills, and to ask for what they need, not what they earn? When is it the Christian thing to do and hold others accountable for their commitments? Didn’t Jesus say that He disciplines those He loves (Heb. 12:6)? It is difficult to hold others accountable and to show tough love when we feel like we are supposed to forgive, show grace, and have abundant mercy. I don’t pretend that there is a cut and dry, right or wrong solution to any of these situations or to the one you may be facing now. I do know that sometimes tough love is required. I also know that God doesn’t promise us it is easy to love others even if it is right to hold them accountable. 1. Holding someone accountable early on may change their future path. We don’t know how people get to where they are. Most of us have a history and some kind of assorted baggage. However, if we know that someone is capable of more, has made a commitment and is not honoring it, or is doing just enough to get by, it is not loving to accept it. We are supposed to glorify God in all that we do. We are supposed to tell the truth. When we don’t hold someone accountable we are saying, “Jason, it is okay to not do your part to make money and to just expect it because you need it.” We are allowing Jack to not carry his weight, potentially hurt our business, and set a really poor example for the rest of the team. And we are telling Sally’s accountant that it is okay that you lied about your experience and put Sally in a bind in her new business. If this is okay for this job, it will be okay for the next. I don’t believe that this is love. 2. Sometimes people make mistakes and there is more to the story. Ask what the story is and listen. Confront the issues with the employee and ask if there is something that you don’t know about that is causing the situation. Is it situational? Will it improve as the situation improves, or is it just an excuse? Occasionally, we learn about something happening at home or that a person has a new health issue. As a Christian, we do want to understand and take the situation into consideration. However, I still believe that discussing solutions and a plan to get the situation under control is still appropriate. 3. Pray for wisdom and discernment. We need to pray about all things, but especially employee issues. We are dealing with people and how we handle the issues that arise do effect lives. Sometimes it is your life. Or your team’s. And always the person being held accountable. Ask God for direction, words to say, and courage to do what needs to be done. Tough love isn’t always easy, but it is loving. It can be Biblical if we discern appropriately. And it can be necessary. I know that having an impact on other people’s lives and livelihood is a huge responsibility. But it is your responsibility if you own a business with employees. The sooner you deal with issues and confront people who require accountability, the better the chances are that you will be able to resolve it. 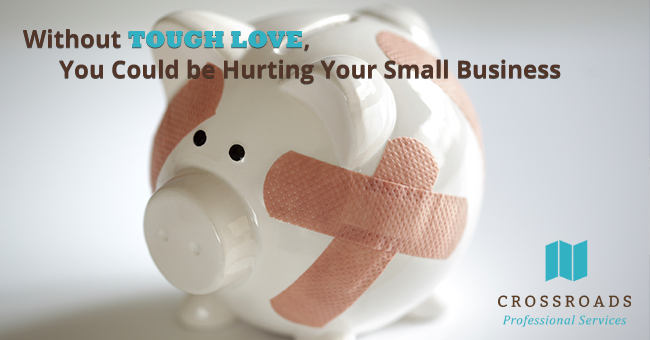 Tough love is tough on you too, but it is the right thing to do. I applied in my mind what you’ve written to the role I have as an entrepreneur, and I came to the conclusion that allowing MYSELF to do the type of work that would be unacceptable in others, if they were in my employ, is not acceptable for me either. The question that comes to mind is, “How do I go about firing the part of me that is not seeking the best for the company?” My answer may apply to business owners too. Get help. Don’t take it all upon yourself. Be driven to get valid second opinions regarding the health of your company and its associates. Hi Rick, I agree that finding help in areas of our business that we are not strong is the best remedy. I also agree that we need to set ourselves up to have accountability too! Thanks for sharing.